Raw ingredients being tossed in coconut oil. I love Autumn. Rhode Island in the Fall is all about Corn, Pumpkins and Apples. Somehow we’ve forgotten some of the more flavorful vegetables. Don’t get me wrong, I REALLY wish I could grill up an ear of heirloom corn, slather it in butter and totally devour it! I would pay for it. Grains are really inflammatory. So, someone like me, with autoimmune issues and chronic pain, should really stay away. When I started my real food healing journey I quickly noticed how my taste buds started to change. Foods that I really hated have now become some of my favorites. As much as I miss my old favorites, the new ones can be very exciting. I used to hate beets. And fennel…tastes like black licorice (that’s not a good thing for me). I really didn’t think I would like it. But, we got some as part of our CSA with Freedom Food Farm and I needed to find something to do with it. First I grilled it. Not bad. I guess I don’t completely hate the taste. I really liked the soft texture when cooked. Sorta like onions, but with a nuttier flavor. I wanted to use it as a flavoring with something sweet. The best sweet vegetable in the Fall are beets. I’ve made this style of beets 3 times in the past 2 weeks and realized that I needed to share. The beets and fennel sorta get candied. The roasted fennel really gives the beets another dimension of flavor, that you’ve got to try. I hope you enjoy them as much as I do. Wash and peel beets. Slice beets in a large julienne style or a large dice. Rinse fennel bulb and cut off the stems with leaves. Finely slice fennel bulb. Pull leaves off of stems and give them a rough chop. Discard stems. Chop shallot and garlic into small pieces. Toss all ingredients in a bowl until everything is covered with coconut oil. Pour mixture into an 11×7 oven safe glass baking dish and cover with glass lid or foil. If you don’t have that size…use whatever is closest. It’s not an exact science! Bake at 325 for 30 minutes, then give them a quick stir. Roast for an additional 30-45 minutes. Remove cover and bake an additional 10-15 minutes or until beets are tender. I like to serve these with ground beef patties and a raw green salad. It’s also really good reheated in the toaster oven for a quick and easy lunch. 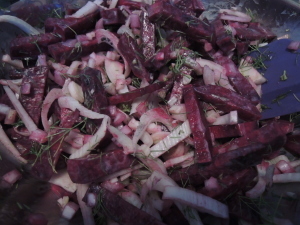 This entry was posted in Recipes, Uncategorized, Vegetables and tagged Beets recipe, Fennel recipe, paleo beets, paleo fennel, roasted beets on September 20, 2014 by rachael.